This week, a Facebook friend published a record of how she was detained by Israeli security, held, and questioned for hours. Her crime? Political activism on behalf of Palestinians and against Israel’s occupation of that nation. Not surprisingly, some of the responses she got were belittling ones, “boo hoo, you’re quite the martyr, having spent three whole hours in security!”, blatantly ignoring the fact that she was being intimidated, threatened, sexually harassed, her freedom curtailed… Also (as she alluded to in her article) she has had other more intrusive run-ins with Israeli security. As a matter of fact, she is well-known to Israeli security forces because of her activism, but as long as her politics are on the “wrong” side, she is to be belittled, and reduced to a whining little girl, rather than the intelligent, political woman she is. Well, this story has moved me to do a little whining of my own. I must admit that while I am also an outspoken, strong, intelligent, and political woman, I have never been arrested for it, or threatened, or tear gassed. I’ve had shouting matches with police, been shoved by them, threatened as part of a group… But so far, I’ve escaped their notice as a focal point. 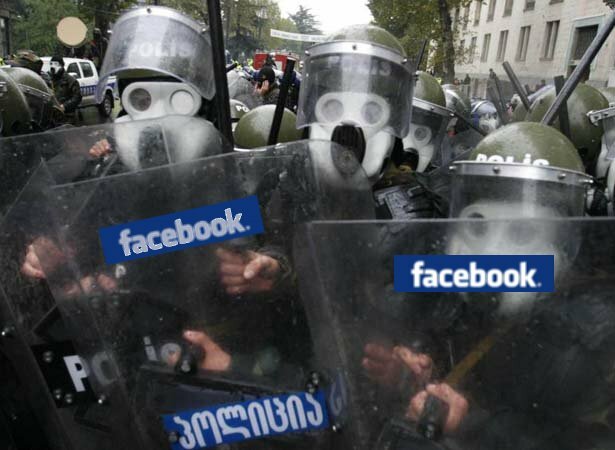 Until, that is, the dreaded FACEBOOK police. This week, the Tel Aviv Pride Parade campaign kicked off. Lo and behold, it is entirely based on nationalistic ideas and imagery. Homonationalism is a problematic concept anywhere, but in Israel it takes on special significance, given the sharp divides between Jews and Arabs (whether citizens or not) and the treatment of other marginalized groups. The reproduction of hegemonic power structures into the “LGBT” community is an ongoing issue. I am fond of calling the LGBT center the “gay-white-man center”, that’s how obvious and blatant the marginalization is. All the men in positions of power there are quick to deny it, and point at the one or two women in the room (somehow, never named, never quoted, never heading up any important projects…). But even the two token white lesbians, does NOT an “LGBT” community make. 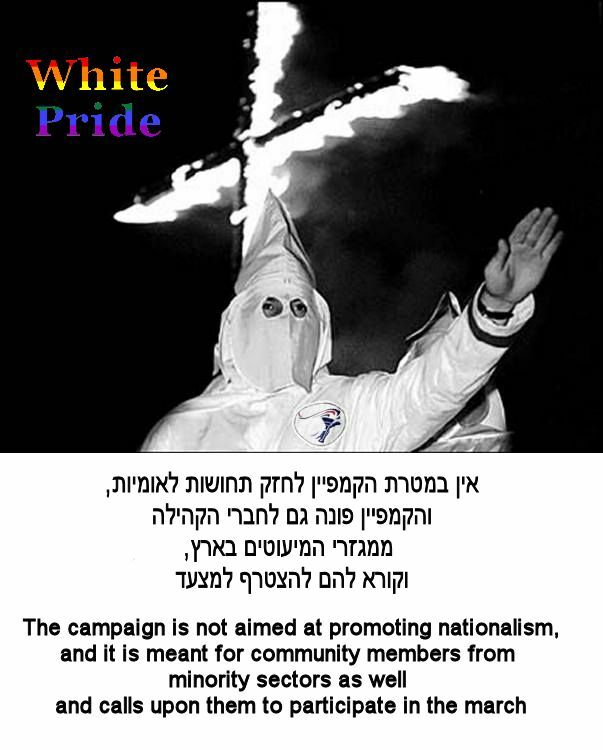 Nor does it encourage any idea of commitment to equality when Ethiopians, Palestinians, any non-Jews (unless they are cute European gay guys), trans folk of any ethnicity, and others are continually made to feel unwelcome. Well, um. Yeah. Minority sectors = Arabs, right? How kind of you!! I mean, it doesn’t really matter how unfriendly you make it for Arabs, as long as you then add a disclaimer in the small print. 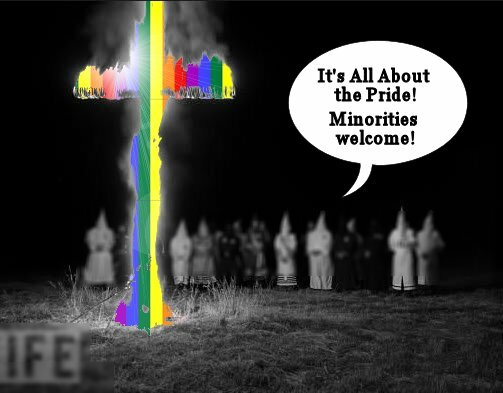 It’s not about the WHITE, it’s about the PRIDE, dummy! Having gotten carried away with my own annoyance at the Center, and my desire to point out the ridiculousness in their assertions of inclusion, I disregarded the fact that Facebook runs bots on your pictures, and can pick out certain symbols. They immediately flagged the klansman, and blocked me indefinitely, putting a dent in my political activism as well as my social life! So now I know what it feels like to be singled out by the police for my activism for social justice. And just for kicks, here is another draft of the idea. This entry was posted in Feminism, Gender, Human Rights, Israel, LGBT Rights, Palestinian Occupation, Racism, Revolutionary Women, Social Justice and tagged civil rights, democratic rights, double standard, erasure, feminism, gender, homonationalism, homonormative, israel, israel gay center, israeli security, israeli security forces, leehee rothschild, LGBT, lgbt center, minority rights, misogyny, palestine, political activism, political woman, pride parade, protest, social justice, white hegemony, women by Femina Invicta. Bookmark the permalink. Just curious–has Facebook restored you to full Facebook personhood? It’s a good thing to remember about Facebook: my personhood can be stripped from me by a bot. How convenient. I guess it isn’t as “free” as we might think. הייתי עושה שייר בפייסבוק אבל אני פוחדת שיכחידו אותי גם! אני אמורה לקבל בחזרה את זכויותיי, רק לא בטוח מתי! אבל חיבוק על הסולידריות !!! שיתפתי, ומקווה שזה יעבור להם מהר. מוזר בעיני החסימה האוטומטית של סמלים מסוימים, מה בוער, למה לא לבדוק כל מקרה לגופו? לחכות עד שמישהו יתריע? Once again, yet another 1st Amendment rights issue ignored by the corporately consolidated media and picked up by bloggers.